43/365 – “Habemus Papam” nr.15, a photo by Luca Rossini on Flickr. 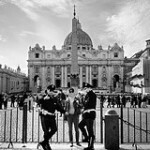 These days it is full of security around Saint Peter’s square. When there’s any event, which gathers tens of thousands of people, the police uses metal detectors and other techie stuff to check all the people (and their bags) before letting them in. When there’s no event, which still means that hundreds of people are around plus the usual one thousand of tourists cueing to get inside the basilica, the police controls all the entrances and the exits to and from the square, monitors everything that happens in the area, and, for the most, answers tourists’ questions and gives them directions. I saw these two cops guarding the square in a perfect relaxed symmetry, and so I was secretly framing them when this weird tourist woman arrived. I don’t know what she asked them, but a moment later the two cops were both pointing directly at me. It was just a matter of a few moments, I took the shot and then pretended I was playing with the camera’s menu, while slowly walking away. I didn’t show the cops the shot, cause I was pretty sure they wouldn’t have been so flattered. 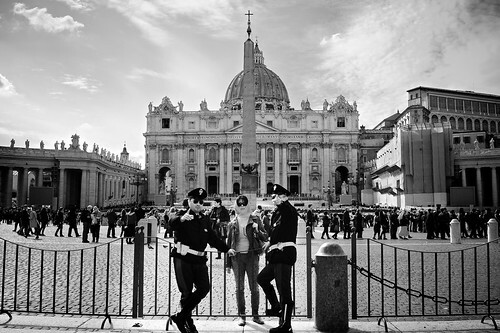 There aren’t cops who like to be photographed anywhere in the world, and Saint Peter’s square is no exception to the rule.